Pineapples always remind me of a nice warm weather with a tropical feel. It is such a great ingredient to cook with but definitely a hassle to buy. Buying a pineapple is hard not only because it is difficult to find out whether it is ripe but also because it is hard to cut. Hence the easiest way to get pineapple is in its canned form. Even though this isn’t a "fancy" ingredient, it is definitely very useful nevertheless. The preserved pineapples have a great sweetness to them that works great in desserts and salads. 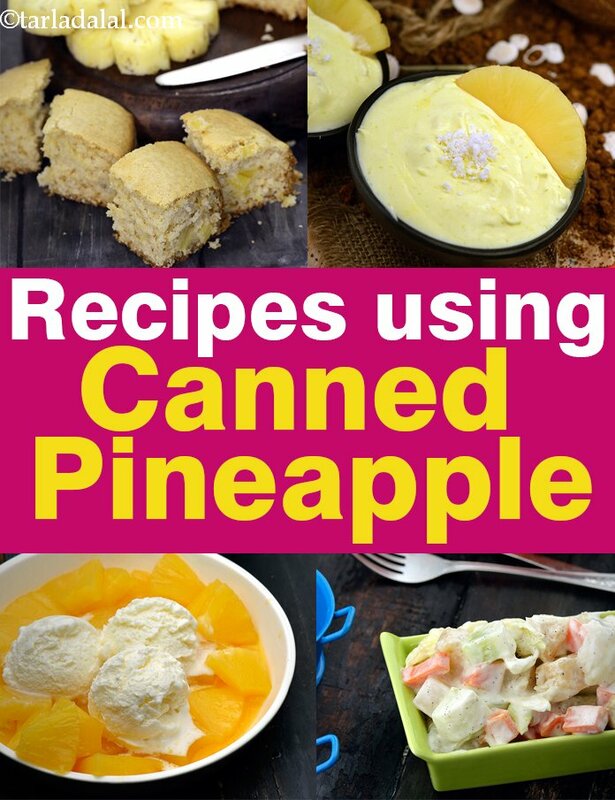 Canned version of pineapple tastes so great that it can be eaten as a dessert by itself! But it can be added to so many recipes too! The Basic Pineapple Sponge Cake, every 90's kid's dream cake, is elevated by chunks of pineapple in it. This dessert can be served at tea time or with ice cream post meals. The softness of the sponge cake with chunky pineapple is an epic combination. When I think of pineapple, I first think of Pina Colada! The flavors of coconut and pineapples come together beautifully in this and same flavors can also be combined to make mousse. This delicious Coconut Pineapple Mousse is fluffy and soft because of the coconut milk and whipped cream coming together with pineapples. Pineapples have been used in vegetable dishes for a really long time, with salads and as a topping too, but never in a Mixed Vegetable Pie. Pies are usually associated with sweets but this is a vegetable mix which is a combination of pasta, rice, veggies and tangy/juicy chunks of pineapples to add to the texture and flavor of the whole dish. Little pieces of pineapples and cherries are also added to Shahi Pulao with a Nawabi Curry. These fruits add freshness and slight sweetness to the complex masala of the pulao. Navratan korma is an easy rich creamy vegetable gravy recipe with an array of mixed vegetables cooked in a delicious onion tomato mix. The veggies are stir fried ina spicy kurma and served with roti or paranthas. Navratan korma(jain) is an easy rich creamy vegetable gravy recipe with an array of mixed vegetables cooked in a delicious cream and tomato based gravy mix. The veggies are stir fried in a spicy kurma, cooked in true jain style and served with roti or paranthas. Add sprite or 7up at the end so that u will get a nice foamy mock tail. Pineapple Moose is a delicious cold dessert for people with a sweet tooth. Enjoy this fluffy and creamy pineapple dessert. A tasty and flavourful, Sour cream Shrikhand is prepared from sour cream and offers an alternative to the traditional hung curd based sweet Shrikhand recipe. Add dry fruits, elaichi powder and fruit slices to perk up the taste and health quotient. Rich Pineapple Upside-Down Cake, delicious dessert made with pineapple. American sandwich, sandwiches are very common food in america, you will find varieties of sandwiches in america, hot and spicy with many spices included. But people of origin cannot eat very spicy meals and sandwiches. So here is sandwich with very mild taste of pepper powder and mayonnaise. Canapes supreme is a supremely healthy and tasty canape recipe which can be made with canape shells or bread slices cut into small cubes,. The filling for the canape shells are made from hung curd, steamed beans and carrots. An innovative pudding reciep,Rasgulla pudding has the Indian dessert king rasgulas as the base and ice cream as topping. Get ready to prepare the awesome No bake pineapple cream cake with this easy recipe. The pineapple and bread crumb mixture is refrigerated and served chilled as cake. If u do not get a tinned pineapple, u can make with the fresh riped one. when using the fresh pineapple, cook with little water until it becomes soft and finally add to the seera. even if seera/kesari is not your favourite, it becomes one when u make it with pineapple. try and enjoy! Super moist tofu carrot cake is truly an awesome cake recipe with carrots and drained pineapple added to the dry cake mix and then baked till soft and done.